Prizes for best costumes, amazing music and the best mood!!! 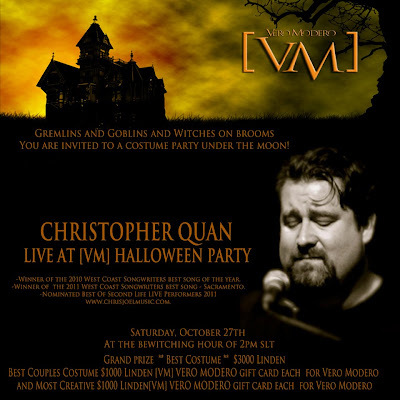 Please join us on Saturday October 27th @ 2pm slt for a Live concert by Christopher Quan ! Wear a costume for a chance to win 3000L or numerous gift cards from VM !! Also, help us support Feed a Smile where your Lindens help feed hungry children. So, Ride your broom..fly, take the limo whatever hoopty you arrive in, just make sure you dont miss this event !